FCA’s bestselling vehicle bar none. For the first time, Ram 1500/2500/3500 sales crossed the 500,000-unit threshold in 2017. Beyond that important number is an interesting fact: the current-generation model was nearing the end of its life cycle. Usually, product sales begin to fizzle late in a model run. Not so with the Ram 1500. Fiat Chrysler took a big gamble when it discontinued its compact (Dodge Dart) and midsize (Chrysler 200) sedans to concentrate on its best sellers, namely Ram and Jeep models. Combined, the two brands offer FCA a powerful 1-2 punch, enabling the automaker to harness current market forces. 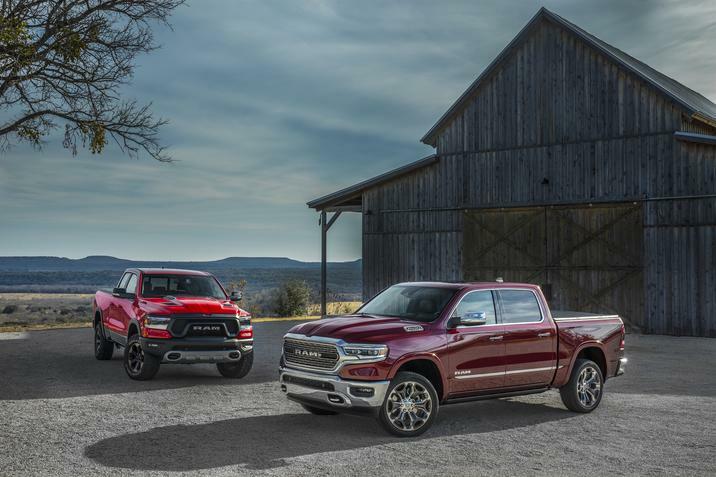 The 2019 Ram 1500 rolled out at the 2018 International Auto Show in Detroit this week, revealing a new model laden with a sophisticated design, expanded safety features, updated technologies and more room. From bumper to bumper, the new model measures nine inches longer than the one it replaced. 1. Lighter, longer and wider. Pickup truck manufacturers continue to look for ways to reduce weight and improve aerodynamics. Ram claims an overall weight reduction of up to 225 pounds on a frame that utilizes 98 percent high-strength steel. The weight loss has no impact on the truck’s overall footprint, however. 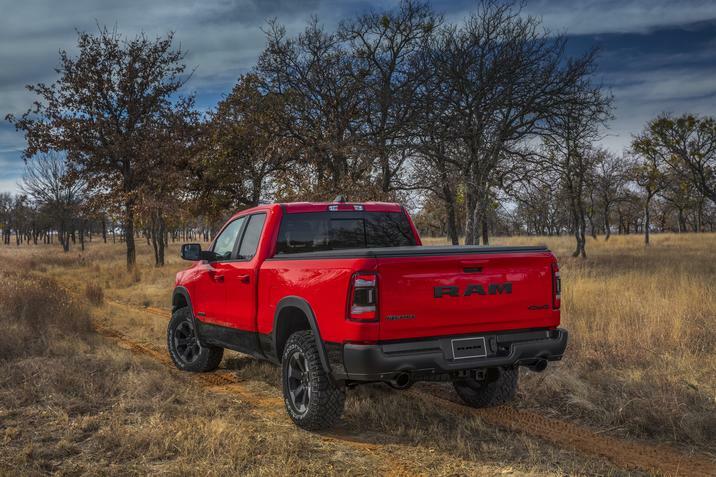 In fact, the 2019 Ram’s wheelbase is up to four inches longer (crew cab models), with width increased by .5 inches and the bed height raised by 1.5 inches. The longer wheelbase translates into a larger cabin providing improved space for rear seating passengers. The rear seats can also recline by up to 8 degrees. 2. Hybrid is standard. The new two main engines for the Ram 1500 are now part of a mild hybrid system known as eTorque. The automaker claims both drivetrains increase fuel efficiency by up to 10 percent, numbers the EPA must still confirm. The system blends a belt-drive motor generator unit with a 48-volt battery pack to control the start/stop function, boost torque and advance brake energy regeneration. As a result, eTorque adds up to 90 pounds of torque to the 3.6-liter V6 engine and 130 pounds to the 5.7-liter V8. Both engines come with an eight-speed automatic transmission. Off-road adventuring with the Ram 1500 Rebel. 3. Improved payload and towing. There is one constant we see with pickup trucks nearly everywhere: improved payload and towing from generation to generation and sometimes within that same generation. For 2019, maximum payload is up to 2,300 pounds and maximum trailer towing climbs to 12,750 pounds. Gooseneck or fifth-wheel towing numbers are not yet known, but will come in somewhere above 30,000 pounds. Yes, that’s 15 tons of towing on select models when properly equipped. 4. Safety features galore. Ram has long made a big deal about its safety and security features, counting more than 100 that are standard or available with its truck. 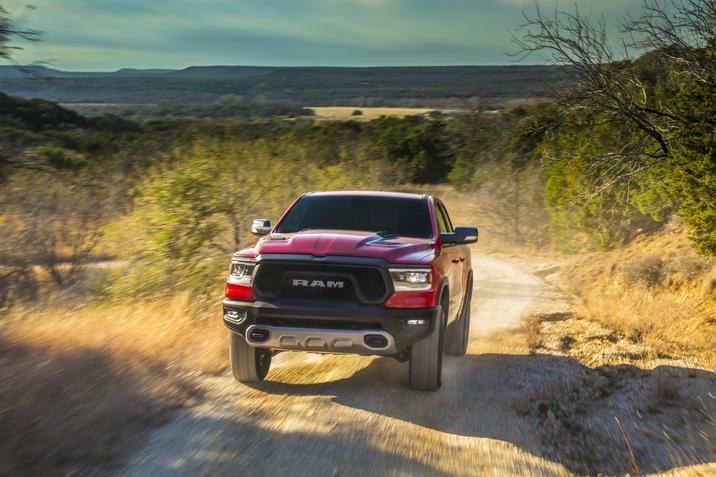 For 2019, the Ram brings adaptive cruise control, forward collision warning, blind-spot monitoring and ready alert braking to the line. The adaptive cruise control system comes with Stop, Go and Hold, enabling the Ram to come to a full stop behind the vehicle in front and automatically resume its speed when the vehicle ahead begins moving. An available adaptive front lighting system points headlamps in the direction the vehicle is planning to go, ensuring improved visibility around curves and on turns. Rear view of the 2019 Ram 1500 Rebel. 5. Segment-leading tech features. 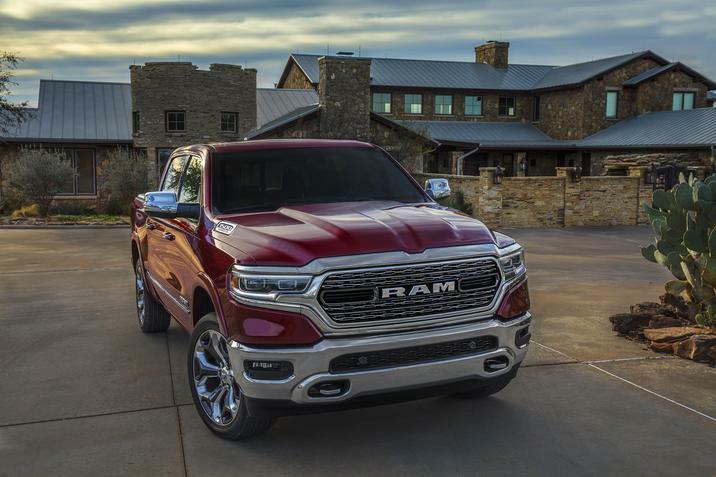 Full-size pickup trucks are big on available tech features, but the 2019 Ram seems to have jumped ahead of the competition. The new truck has a 12-inch infotainment touchscreen with split-screen capabilities. This means you can display two functions at once, such as navigation and audio. You’ll also find a 360-degree Surround View Camera with a bird’s eye outlook of the vehicle, the latest UConnect interface, and an available 19-speaker Harman Kardon audio system. 6. Two are better than one. FCA’s ditching of two car models frees up capacity elsewhere. This allows the automaker to build both the current and upcoming generation Ram models concurrently. With production of the 2019 Ram beginning this month, you’ll find two Ram 1500 models in showrooms for up to a year. The added capacity could help FCA increase market share and narrow the 85,000-unit gap between itself and the No. 2 Chevrolet Silverado 1500. It is a risky move for FCA, but one the automaker believes will pay big dividends. 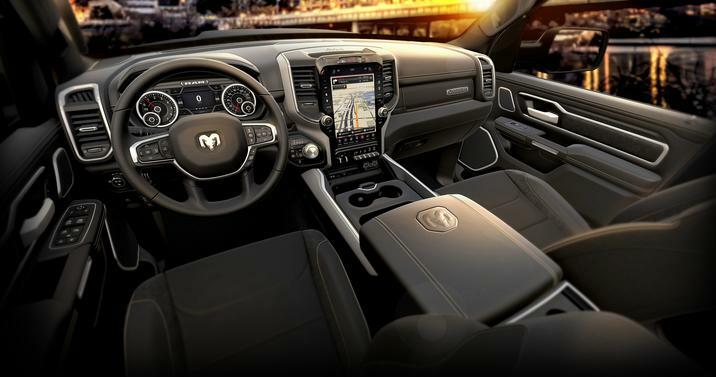 The interior of the 2019 Ram 1500. The new Ram comes to the market as truck sales continue to rise. Indeed, for 2017, pickup truck sales rose by 4.8 percent in a market that was down 1.8 percent. Sales may decline again slightly in 2018 as forecast, but continued growth for the truck segment seems likely. With a new sales threshold behind it, Ram remains focused on taking its pickup deeper into unchartered territory. As for prices, we expect that information just ahead of the new truck’s release. Further, Ram made no mention of the 3.0-liter turbo-diesel engine, although we expect it will return. Photos copyright Fiat Chrysler Automobiles. All rights reserved. 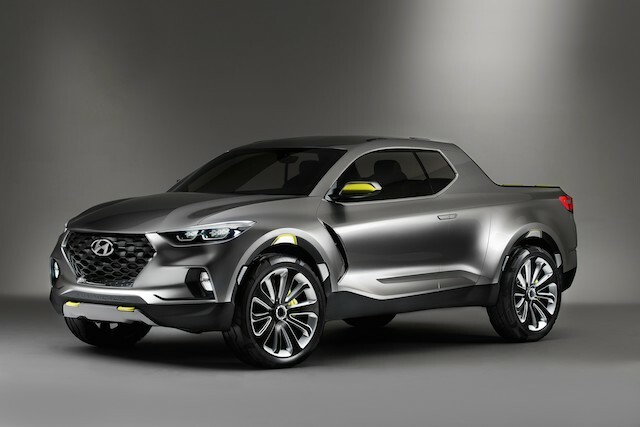 The concept Hyundai Santa Cruz pickup truck. The first day of the 2015 North American International Auto Show was replete with numerous releases ranging from the expected to the extraordinary. There was so much material distributed that we’ve added a few of those stories to our initial synopsis of the second media day. Hyundai-Kia is the fourth largest automobile manufacturer in the world, but like the Volkswagen Group its US presence is smaller than many of its competitors. Both manufacturers have something in common that explains, in part, why their respective market shares are smaller: a lack of a pickup truck offering. Pickup trucks are popular with consumers, highly profitable for manufacturers and help amplify a brand. Imagine Dodge never having Ram — that Fiat Chrysler (FCA) brand would have disappeared long ago. Instead, Ram is such a strong seller that it is now a brand unto itself. Hyundai, in the all-wheel drive Santa Cruz Concept, is taking a stab at a market that few are covering today. And that would be a small, unibody pickup truck along the lines of the retired Subaru Brat. Its a niche market that Hyundai identifies as for “Urban Adventurers” or millennial-type buyers who aspire to the utility of a pickup truck along with the ride and handling of a small car. The Santa Cruz is essentially a car-truck, what the Chevrolet El Camino and Ford Ranchero once were and the Subaru Brat best articulated in modern days. Unlike some models, this one has a rear seat, accessible with is rear-hinged, rear doors. These doors are fully integrated with the front door design, enabling this truck to retain its two-door look. 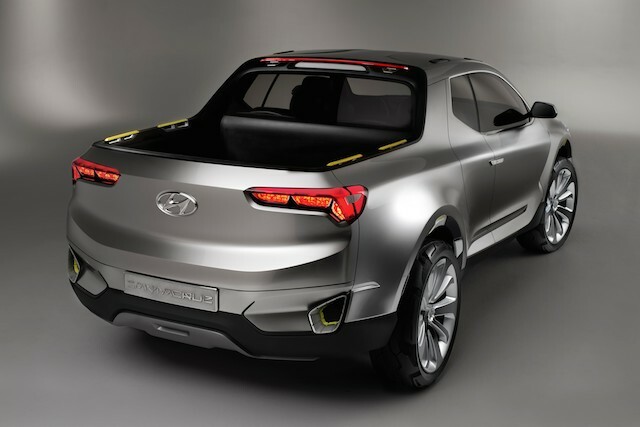 Would Subaru Brat fans embrace the Hyundai Santa Cruz? To the rear, the Santa Cruz showcases an expandable bed for extra utility. The longer cargo space is attained by making use of a special drawer-like sliding function. Hyundai proposes using a turbocharged 2.0-liter diesel engine, making 190 horsepower and 300 foot-pounds of torque. Theoretically, this truck could achieve 30 mpg, an important efficiency threshold that not one of today’s truck models attains. Although many concepts are never built, you have to think that Hyundai is seriously weighing its options in a bid to serve a segment it doesn’t currently reach in North America. Certainly, the Santa Cruz is far different from traditional body-on-frame pickup trucks, but it has the potential to fill a void that some people see as having been left open since Subaru ended production of the Brat more than 20 years ago. 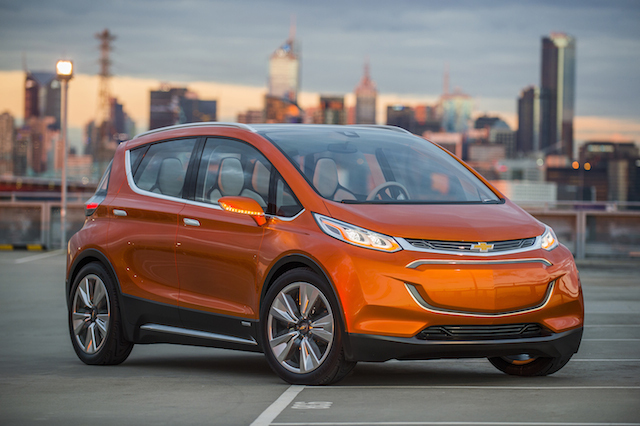 Will the Chevrolet Bolt EV Concept become a production reality? With gas prices falling below $2 per gallon in many places, talk about electric vehicles seems almost absurd. Yet, the current price plummet simply will not last — more than likely we will see prices return above $4 per gallon some day. Car manufacturers cannot afford to be sentimental when it comes to prices at the pump. Indeed, federal fuel regulations require manufacturers to achieve a 54.5 mpg average in 2025 — that’s just 10 years away. Electric vehicles will play no small part in helping manufacturers attain those averages, though the challenge to convince you to purchase an EV is a significant one at that. General Motors has been busy doing its part in advancing vehicle electrification, chiefly with its hybrid Chevrolet Volt. But it also is knee deep in pure electrification as it has a smattering of EV products of its own. One of those products is currently in concept form and was introduced at the Detroit auto show on Monday. 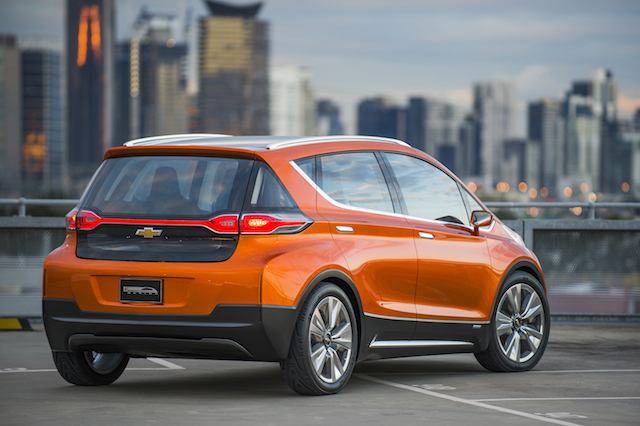 The Chevrolet Bolt EV concept could be just the vehicle to cajole people to making a switch, especially given its proposed $30,000 price tag and 200-mile range. What sets the Chevrolet Bolt EV Concept apart from the pack is its mini minivan-like layout, with very little front and rear overhang. It has been designed to maximize interior space and offers seating for four. GM’s designers looked to amplify its interior space for maximum comfort and in the concept, it appears that they have succeeded. Using glass all around makes this model seem large, even commodious compared to other small vehicles. A high belt line sweeps upward to the D-pillar, what gives this vehicle a look that is at once sporty as it is elegant. In its design, GM made good use of such lightweight materials as magnesium, aluminum, carbon fiber and woven mesh. Moreover, its aerodynamic design plays a significant role in helping this model maximize its efficiency. In GM’s presentation, the company was big on its conceptual homily, but small on its engineering application. We know nothing about the battery system that allegedly enables this vehicle to attain its 200-mile range, a number that is approximately three times longer than what most current EVs deliver, although it does align with basic Tesla models. Therefore, the only thing we can surmise is that the enhanced battery system is something that GM would like to attain and at a price point consumers would embrace. A full reveal of the Jaguar F-PACE is on its way. You will be forgiven if the name Jaguar F-PACE does not easily roll off your tongue. Not that the pronunciation is difficult, rather that it is one of those names that may bewilder the big cat enthusiast. The British marque, along with its LandRover consort, have been making great strides in recent years in a bid for relevance. Jaguar LandRover sales are up around the world as parent Tata Motors gives the dynamic duo much room and independence to grow. In the Jaguar F-PACE we have a model that will go on sale early in 2016, a five-passenger crossover utility vehicle underpinned by the brand’s innovational aluminum architecture and state-of-the-art suspension system. Based on the Ian Callum’s C-X17 concept car, the F-PACE maximizes cabin space and provides the types of on-road dynamics that luxury utility vehicle buyers prefer. Jaguar offered scant details beyond the show and tell, but we know that the upcoming “performance crossover” will be based on the same platform driving the XE sedan. Jaguar may seem as if it is crossing into LandRover territory with the utility vehicle, but there is a difference that should be noted. Whereas LandRover’s are designed with off-roading in mind, the F-PACE is designed solely for advancing its on-road antics. A full reveal is likely this spring at the New York International Auto Show. Photos and news details supplied by the car manufacturers.